Breathing higher concentrations of oxygen has several benefits; the most commonly reported benefits are increased energy, an uplifted refreshed feeling, clearing of the mind, relief of toxic headaches such as the hangover, relief of stress, and promotion of higher concentration levels. Oxygen is also a proven detoxifier and has anti-aging properties. Our Oxygen Lounge provides air with around 92% Oxygen. This high Oxygen content air is pumped to stations around the lounge where visitors can connect and breathe in comfort. Proponents of this Oxygen Therapy say it boosts energy levels, increases your endurance during exercise, helps you bounce back more quickly from physical exertion, provides relief from stress and pollution, increases your concentration, helps you relax, eases headaches, hangovers, is perfect for those who have smoker's lung, and for those who have asthma. WHY CHOOSE OXYGEN IN—TOXINS OUT? The secret of life is creating energy and then properly managing it. Breathing is our primary source of energy. Emotions are part of that energy, in motion; the feelings part. We draw all our energy from oxygen. At the end of every metabolic reaction, is oxygen. Oxygen literally burns a million incredibly slow fires inside our bodies every second of every day. Without it, every function in the body would shut down. Oxygen is responsible for producing up to 90% of your body’s energy and it makes up approximately 96% of your body’s nutritional needs. ​Atmospheric oxygen levels are only around 20% of the air we breathe, delivering less than optimal levels to our lungs to be at our absolute peak of performance – both mental and physical. The oxygen bar delivers an ideal level of oxygen to your system to take you to that peak performance. Medical oxygen is 100% pure oxygen and you must have a license to dispense and a prescription to receive. Our oxygen bar dispenses commercial grade oxygen, which is around 92%pure oxygen. These guidelines include using NO medical equipment or medical supplies and making NO medical claims. Recreational oxygen falls under the Supplemental Act of 1994 that allows supplements such as herbs and vitamins, as seen on the shelves of health food stores, to be sold over the counter to perform different functions without being evaluated by the FDA. (That is why you see disclaimers that say "These statements have not been evaluated by the FDA"). Our oxygen bar is one that dispenses oxygen through a non medical, new, straight from the package, nose hose. 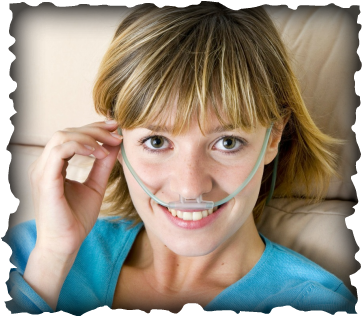 A recreational oxygen bar is not intended to diagnose, treat, cure, or prevent any disease or illness. Persons with any medical condition such as a lung disorder, asthma, emphysema, or pregnancy should consult with their physician prior to the use of a recreational oxygen bar/lounge. If you have emphysema, Oxygen Therapy is not for you. Too much oxygen can cause a person with emphysema to stop breathing. How often? The benefits can be felt after your very first session. Oxygen Therapy is recommended only once per day and at no more than thirty minutes per session.